Farzad Kohan is included in the third installment of Advocartsy’s Art Brief III: The (Un) Draped Woman, a multimedia exhibition exploring the cultural and historical constructs of women and the female form as represented within Iranian contemporary art. Taking place at Arena 1 Gallery in Santa Monica, California from 9-18 February, Art Brief III will showcase the works of fourteen North American based Iranian artists, and is accompanied by a scholarly catalogue. 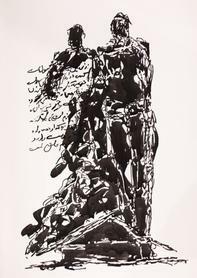 Kohan is represented with three ink drawings on paper, reflecting abstract imagery that are delicately rendered and accentuated with Persian letters and numbers in addition to other enigmatic symbols.